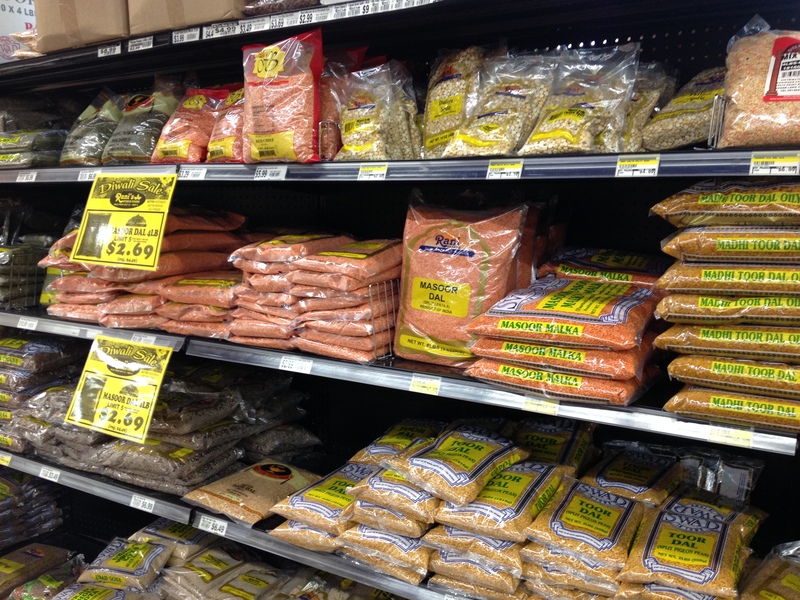 At Rani’s World Foods, I found shelves and shelves of different kinds of lentils and dal; produce that I had never seen before; interesting spices and flours; sugar called jaggery and a whole lot more. I had poured through Julie Sahni’s book and made a long list of special ingredients to look for. I think I may have been roaming the aisles of the store wide-eyed for kind of a long time. I’m not really sure, I was sort of in a foodie trance, I think. When I got home, I started chopping, mincing and measuring. 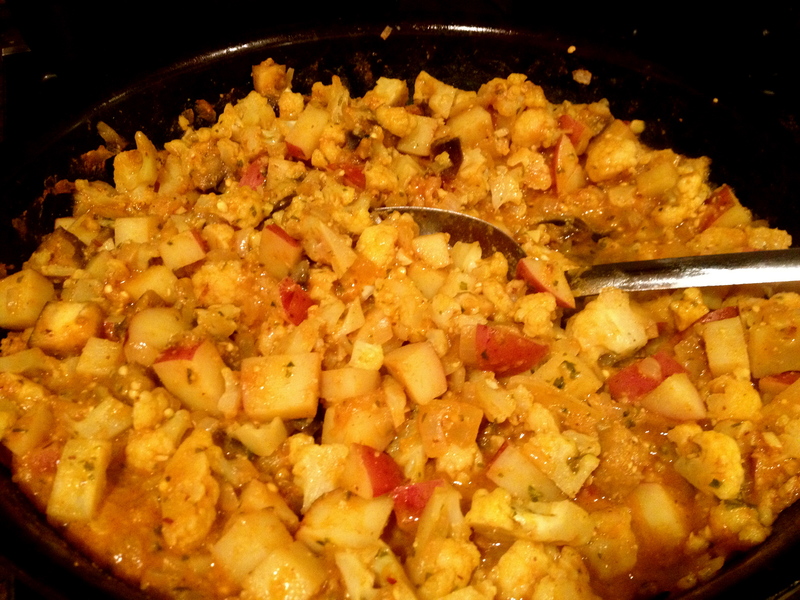 I created an Indian food feast that centered around the cauliflower/eggplant/potato korma. The sauce is an almond-tomato based herb sauce that is so delicious. You can get creative here and add different vegetables or spices. 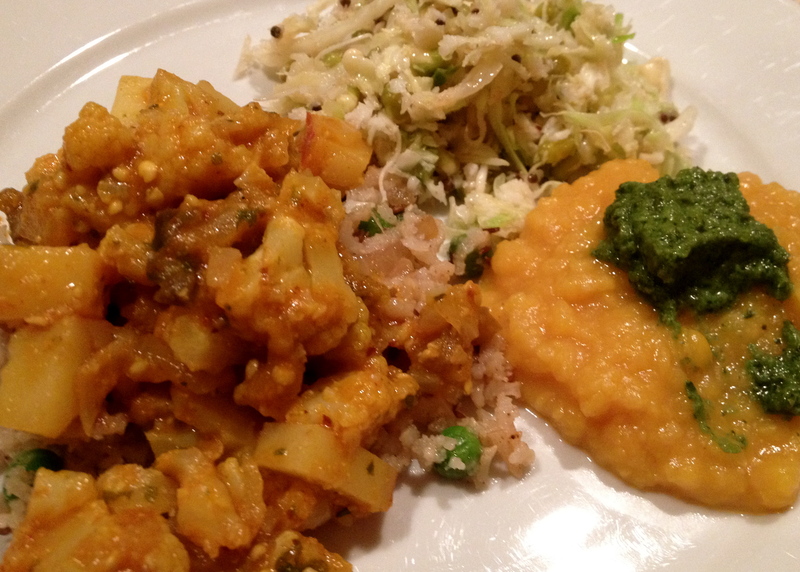 I served the korma with a sweet cinnamon-y fresh pea basmati pilaf, yellow split pea dal and a cabbage coconut salad. (I’ll share some of these recipes in an Indian food, part II post soon.) The meal balanced many different tastes, textures and temperatures. It made a lot, which I shared with my dear friend Trish and happily ate as leftovers for days. Measure the spices and place them near the stove in separate piles or ramekins. Heat oil in large heavy skillet over medium-high heat. Add onion and saute, stirring, until browned (about 5-10 minutes). Stir in the garlic and ginger and continue cooking for another 2 minutes. Add the cilantro and ground almonds and cook for 2 more minutes. Stir in the ground coriander, fennel, cayenne (if using) and turmeric and let the spices sizzle for a few seconds. Add the tomato sauce and paprika, reduce the heat to low and cook for 2 minutes. Stir constantly to prevent sticking and burning. Add 1 1/2 cups water, cauliflower, eggplant and potatoes; raise the heat to high and bring to a boil. Lower the heat and simmer, covered, for about 45 minutes or until the potato is tender. Season to taste with sea salt and adjust spices if desired.